Sunrise Shell jewelry: Unique necklaces, bracelets, rings, anklets, and earrings inspired by beautiful Kauai. 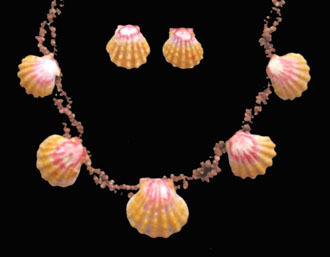 Shell jewelry for casual or dress. Also available are beach glass, kahelelani jewelry, and other shell originals. I have lived and worked on the incredible island of Kauai for over 20 years. The exquisite Sunrise Shell, as centerpiece, inspires our artistic creations and combines with semi-precious gemstones, pearls and other shells, as well as sterling silver and gold. Sunrise Shells are compared to precious stones due to their scarcity and rareness and are held in high regard. In Hawaiian folklore only the royalty were allowed to wear them. These pieces are truly a precious Kauai keepsake. See my slide show at www.sunriseshell.com.